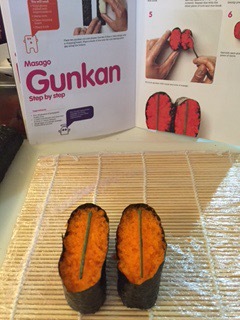 Today, I went to sushi school! I love sushi. Having lived so many years in Vancouver (Canada) I have also eaten more than my fair share of it. So I like to think I have more than a basic understanding of sushi too. Which brings me to sushi school. 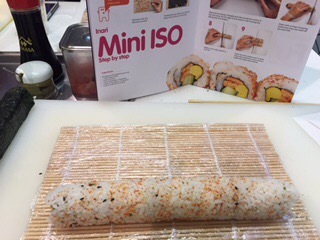 Yo Sushi (at Harvey Nichols in Edinburgh, one of many around the country) offer a sushi making class in their restaurant. It took place during their usual opening hours at a set of their tables next to the kitchen area. There were eight of us in the class, in two tables of four. I came along with a friend and we were paired up with another couple at the somewhat cramped and overfilled table. The head chef was our instructor and he was assisted by another one of his chefs. It certainly felt like we were getting the best treatment taking up his valuable time whilst the restaurant was still in full swing on a busy Saturday evening. We started by fitting ourselves with latex gloves and oiling these to prevent the rice sticking to them. 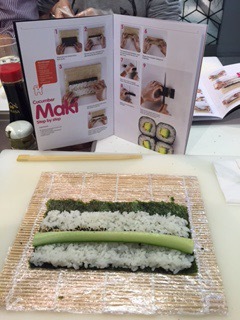 We opened our accompanying booklets to the first roll to be made and took our half sheet of nori (shiny side down!) to build our cucumber (kappa) maki. We were told we needed to take 80g of rice – very hard to judge this amount by eye and a few of us would have liked a set of scales or some other measure to get to grips with this. Nonetheless, we managed to lay out a pretty decent amount of rice and both the head chef and his assistant were hands on ensuring we had the correct amount. 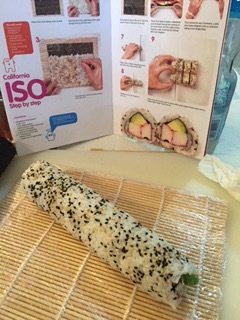 Next followed the prepared cucumber portion and then we were off perfecting our rolling technique! The Mini ISO was next. 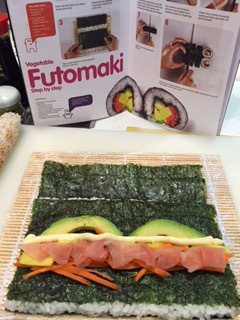 This was a larger roll using a full sheet of nori. We spread the rice filling all but a 2cm strip across the top and then we sprinkled some seasoning across this. Then we were asked to flip the nori with rice over. Filling spread across the middle and suddenly we were rolling again. This time it was a bit tricker ensuring the filling stayed put and the rice covered the outside. Most of us seemed to manage this okay. Part of the trick here is, once you have successfully rolled it together, wrap the bamboo matt around the roll completely and use your hands to encircle the tube as you twist around making the roll tighter. We then went on to vegetable futomaki which included an extra sheet of nori on top of our bed of rice. This, we were told, is used for fillings which are a bit more wet and helps prevent the roll from falling apart. Otherwise the technique was not much different. The California hand roll (cone) was next. Here we formed the rice into a triangle in the corner of the nori sheet. 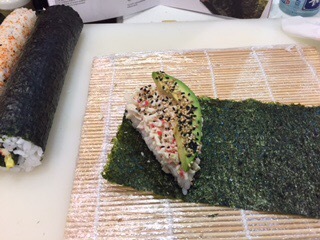 Added our fillings on top and holding the nori with the rice in one hand we wrapped the rest of the sheet over and around to create the conical shape. 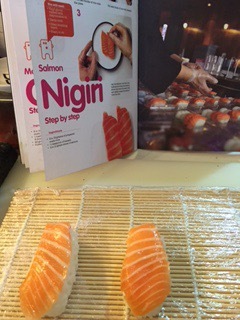 For pure speed and enjoyment this was by far my favourite sushi to make! We then progressed to the California iso which was really very similar to the mini iso. And our final two were pieces of sushi, the first was the masago gunkan which is flying fish roe on top of a bed of rice and kept in place with a strip of nori around the base of rice, making a well in which the roe is added. And finally the salmon nigiri which was a strip of salmon sashimi atop a bed of rice with a dollop of wasabi between the two. Overall it was a lovely evening and we had fun building our sushi. We saved all but our cones to be eaten at the end of the class, whilst the group at the other table took to eating theirs as they went along. The staff kindly cut our rolls and packaged them up for us in take away containers. We’re were also given our choice of drink at the start of the class and given time to eat our sushi before we left for the evening. Unfortunately they ran out of some ingredients during the class which was a little disappointing. Also, as the restaurant was still in full service, at times it was difficult to hear the chefs speaking over the noise from the other tables. The only other thing I would mention was the lack of table space. It is generally quite cramped for eating but even more so with all the materials for making sushi! I also love sushi. I am from California so we have a lot of it here too. I love eel and salmon. Your class looks fun. I should look for that in San Diego, where I live.